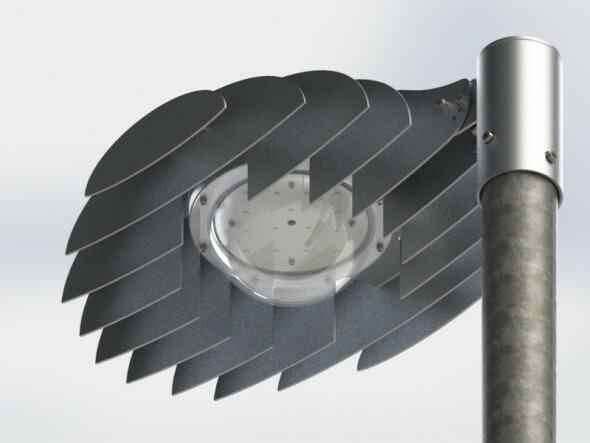 The Cyberlux is an outdoor light which has a special design. This shape is first of all efficient but also eccentric. The fins allow to scatter in the air the heat produced by the LEDs but they also offer a very low resistance to the wind, which is ideal at the top of high masts. The power of the lighting starts at 30W but can go to 50W easily as a wish from the customer. It’s also a waterproof light, so it can resist through bad weather conditions such as heavy rains or dangerous winds. Finally, the Cyberlux is delivered with it’s own fixing brace, on a wall or on a mast, where you can adjust the orientation of the lighting.